"When I finish my studies I want to get more experience about my career and also practice what I study at this institution. After that, I want to have my own business" was Mohd. 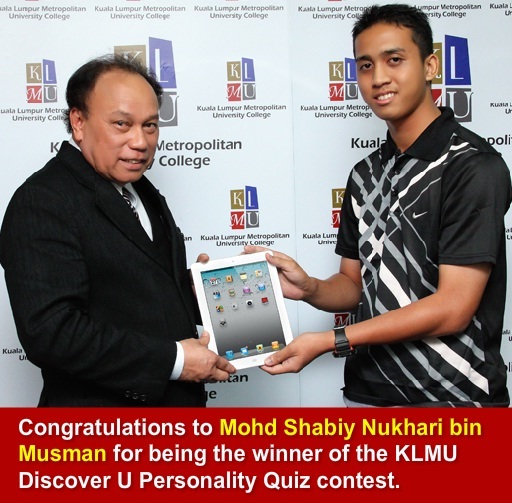 Shabiy Nukhari Bin Musman's slogan that made him won iPad2s during KLMU Discover U Personality Quiz contest campaign recently. There will be one more KLMU Discover U contests and the prizes for the winner is still iPads2s for the most creative slogans submitted together with the completed 'Discover U" Course Personality Quiz. The contest ends on 30th March 2012, about 3 months from now. Grab this great opportunity and win Ipad2s. Nothing is impossible. You could be the next winner. For more information visit KLMU Discover U webpage.